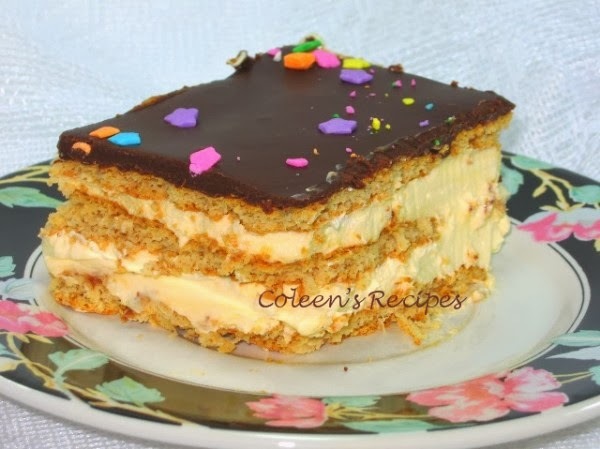 The Éclair Cake idea has been around for years. It is a magical dessert that starts with pudding mix and graham crackers, and when it sits in the fridge overnight, something magical happens. The graham cracker layer "softens" and sort of turns into a "cake" layer (people are shocked when they find out its just graham crackers). The whole thing is delicious and my family has enjoyed it a million times. It is also a HUGE HIT at potlucks. Place a single layer of graham crackers in the bottom of a 9x13 dish (breaking to fit if necessary). With an electric mixer, beat the instant pudding and milk until very smooth (about 2 minutes) then fold in the Cool Whip. Immediately pour half of this mixture over the 1st layer of graham crackers, spreading it out evenly. Put another layer of graham crackers on top of the pudding and then another layer of pudding mixture. Top second layer of pudding with a final layer of graham crackers. Cover the dish tightly, with plastic wrap, and refrigerate for about an hour before you frost it. After an hour of chilling, whisk together the melted butter, boiling water, cocoa and vanilla until well blended. Add powdered sugar and whisk until smooth. Immediately pour the frosting over the chilled pudding dessert and gently smooth it out. Place dessert (uncovered) in fridge for an hour or so (until the frosting feels dry to the touch),then stretch plastic wrap over the pan(stretching it tightly so that it doesn't sag and touch the frosting)or you can just snap a lid onto the dish. NOTE: After this "cake" has been in the fridge, overnight, it is easy to cut into squares to serve because the graham crackers are soft. NOTE: I recently made this with chocolate instant pudding and chocolate graham crackers (followed the recipe otherwise). After it sat overnight in the fridge, the chocolate graham crackers tasted just like chocolate cake....excellent variation.